This summer I’ve explored Golden Gate Park, Mount Sutro, Twin Peaks, Glen Canyon, and the forest around Sutro Tower – some of those more than once. I should put some posts together about those. I wanted to visit someplace new to me, so yesterday I went on the longest-distance hike from home that I’ve done in quite some time. All these years, I’ve ridden past the peak of Mt. Davidson, in the center of town, but have never scaled it. I decided it was time for the trek. I grabbed the dogs and went out on the four-hour round trip (though it could easily have taken just 2½ if I’d been on a mission). After plotting my route to get there, I decided the most direct approach was the best, and would save the heaviest climbing for the peak itself. I walked up Market from the Castro, until it turns into Portola. Then, I hung a Louie at the old Tower Market up there, followed Teresita to Isola, then a right on Rockdale at the Stanford Heights Reservoir. The street ends at one of many trails up the hill through the forest. Mt. Davidson and the immediate surroundings. The general region of the mountain is called the Midtown Terrace. 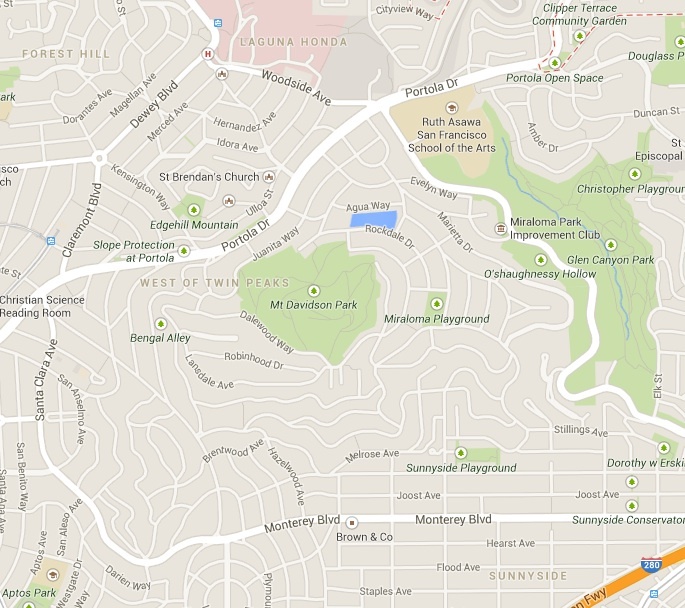 It’s basically a saddle (or series of saddles) between the summits of Davidson, Sutro, Twin Peaks, etc. 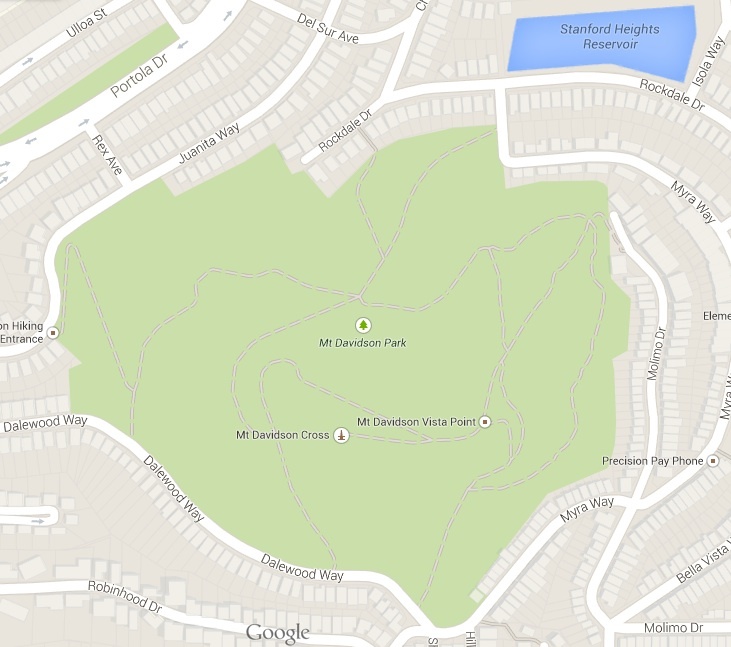 Early last century, there was no development up there, but by the 1930’s much of the Davidson area was being built up. The 1960’s saw massive development of the terrace, and a backlash that led to open space protection legislation. Mt. Davidson anchors the southern end of the Midtown Terrace. The mountain summit is 928 feet above sea level, and is largely covered by Sherwood Forest. The forest is mostly eucalyptus trees, with a smattering of Monterey cypress and a couple of redwoods and Monterey pines. The windward side of the hill is exposed to the ocean winds, and the fog that comes in on them. With all the trees, they act like a “fog-comb” and the whole forest is dripping wet. The ground is saturated with fog, and a little slick. In places, grading and excavation has revealed the folds and curves of the geology, and you can see the hill was once part of the ocean floor, with built-up layers of radiolarian chert and serpentinite. The understory of the forest is quite choked with invasive plants – ivy, German ivy, blackberries, cotoneaster – but there are pockets of natives and less invasive non-native plants, like fuchsias, leather ferns, elderberries, grasses, Douglas iris… I even saw one gorgeous fuchsia I’ve never seen before: it was the daintiest little thing, and pure white. I couldn’t get close enough to it for a pic, though. Mt. 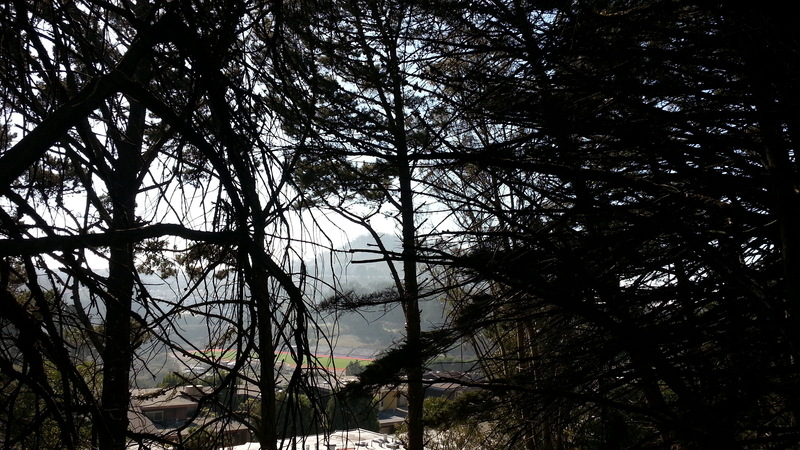 Davidson, through a stand of pines where Market turns to Portola. The paths up the mountain don’t quite match up to those on the Google map. Not even close, really. There are so many more to explore than are charted there, but I found my way with no problem (up is up, after all). Plus, when I did try to see where I was with the maps app, the GPS was literally more than a mile off, putting me in a completely different neighborhood. That was kinda refreshing, though. Made me rely less on technology and just enjoy my surroundings without having to obsess on my exact location. Mt. Davidson in the distance as you pass the pines. Perhaps the most prominent feature of the mountain is that it’s topped by a giant Jebus Stick. A giant concrete cross sits right at the summit, and the area in front of it is leveled for annual Easter services to be held there. There are some interesting signs at the entrances to the forest, proclaiming the independent ownership of the cross and level areas at the top. Early in the cross’ history, it was wooden and kept getting burned down. The last wooden cross, incidentally, was SF’s most popular suicide jump-off until the Golden Gate Bridge was built. Eventually, the Jebus Stick was cast in un-scalable concrete, as it remains today. In the 1990’s (I remember this well, as a proud voter on this specific legislation myself) there was much controversy about a public space containing secular symbolism. In the interest of separation of church and state, it’s completely inappropriate for public funds to be used to maintain religious iconography, regardless of the popularity of that particular religion. That’s not to say a cross can’t tower over a city in America, but it’s misuse of public funds for government agencies to maintain it. The City was sued to either remove the cross or relinquish the land to private ownership. In 1997 it went to popular vote, and the citizens of SF agreed that it was a violation of the US Constitution to continue to retain ownership of the cross, and the decision was backed by the courts. The offending Jebus Stick and surrounding terrace where services are held was sold to the Council of Armenian American Organizations of Northern California, to be maintained for public access at the expense of the secular non-profit. It was a proud day in SF’s history for the defense of the US Constitution. Looking across the reservoir on Rockdale. Sutro Tower on the horizon. Today, the cross still stands, and if you do the Jesus thing you can go worship at it. For the rest of us, it’s just a great place to go hike for some exercise and views. The views in the forest are gorgeous and mesmerizing. This particular morning, the fog hadn’t totally dissipated, and there was a mist in the trees. The eastern side of the mountain is clear of forest, and instead is growing CA native habitat, with coyote bush, grasses, mahonia, ceanothus, and even a bit of poison oak. The views from the vista point on this side are phenomenal, even when dominated by group of picnickers and their silence-piercing herd of particularly obnoxious children running through the brush and ripping up the forest with no parental oversight. I kept hoping the signs warning to be aware of coyotes would make the group reign the kids in just a little bit, but no such luck. It’s a beautiful spot to linger, so you can’t blame them for going and bringing the kids to burn some energy outside. At least they’re enjoying the outdoors. 🙂 I can be such a curmudgeon sometimes. On the way to and from the forest, I really enjoyed the views and my surroundings, too, and enjoyed the varying architecture of the different neighborhoods. I passed a stand of pines along the Market/Portola junction and caught a whiff of pine aroma that made me flash back to childhood camping trips. Also along the way I passed the Ruth Asawa School of the Arts, which, being a Saturday, was closed for the day. (I recently learned a lot about her in my humanities class, History of Women in the Arts.) I found some great spots to snap pix of the dogs for their blog, Spoon and Toast, and had a chance to let them spazz out in the parking lot for a spell. We all had a great Urban Hike, and a nice rest afterwards! Proclamation about separation of church and state. Light and mist in the forest. Wow. What a stunning forest! A fuchsia along the trail. Gorgeous topography with lithophytic ferns overhead. Looking down the mountain over a hillside of grasses. Ferns living epiphytically on the trees themselves. Just stunning views through the trees! Old stone staircases, with grasses cascading down the cliffs from overhead. Check out the twists and turns of the folded layers of rock. These layers would have formed by silt settling on the sea floor, and then folded when it was still in a softer clay state. Random hole with a stick in it. The moo-dogs sampling the grass. A “vista point” where you can only see trees. Nice rest stop, though! The vista from the vista point. A hint of downtown through the trees. Here comes the Jebus Stick. Placquard at the base of the cross. Plaque commemorating genocide in Armenia, and dedicating the cross. Nice old Monterey cypress alongside the cross’ platform. See the tiny people at the base? It’s a biggie! You can see why this would be a popular spot for Easter services. A panoramic shot with downtown to the north (left) and San Bruno Mountain to the south. A cool skeletal fallen eucalyptus on the edge of the barren eastern vista points. Midtown Terrace. You can see Mt Tam in Marin on the horizon. Fog is the Golden Gate. 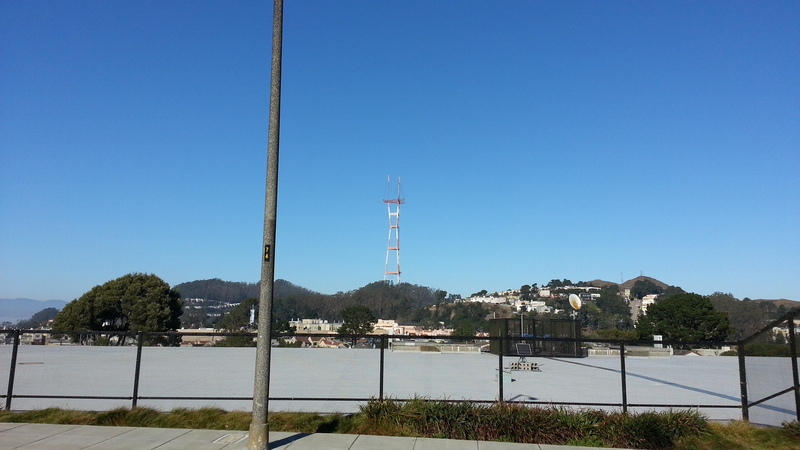 Sutro Tower and the downtown skyline. Another focus of Midtown Terrace. The large peach institutional building left-of-center is Laguna Honda Hospital. 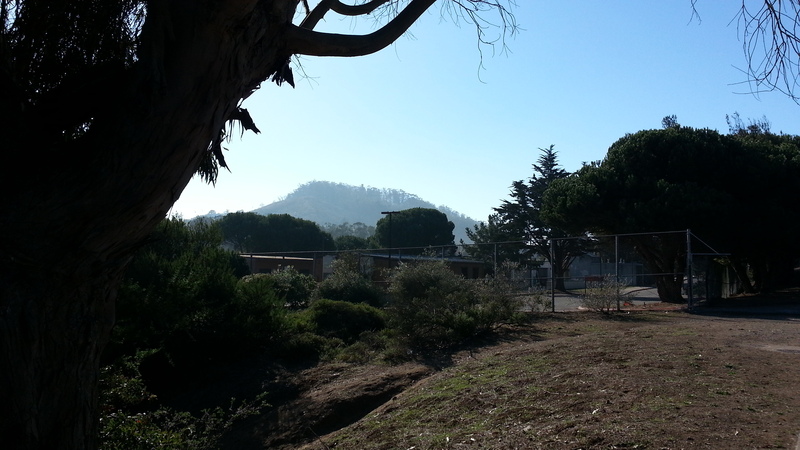 To the right of it is the massive Juvenile Detention Center. The gray roof in the foreground is the reservoir from earlier. The pups taking a rest. Grass and ferns on a eucalyptus stump. The foot of a path on the southern side of the mountain. A path back down the mountain. Some nice geology, fronted by a patch of Fascicularia pitcairnifolia. 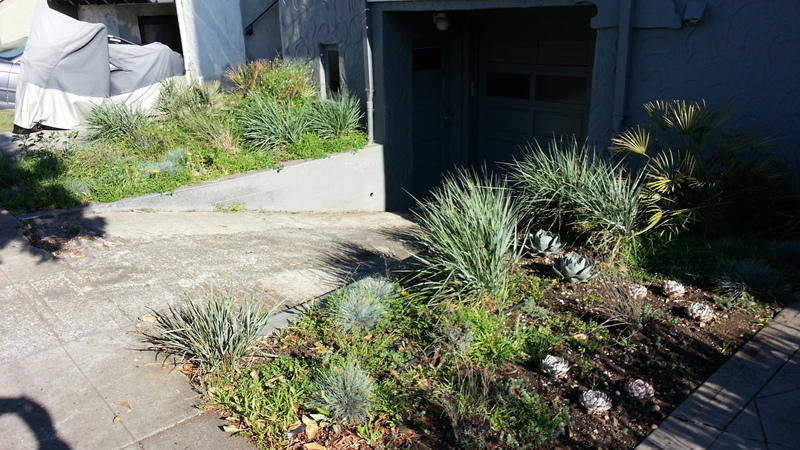 This entry was posted in Gallery Posts, Urban Hikes and tagged botanical, california natives, climate, fog, garden, gardening, horticultural, microclimate, natives, parks, plants, recreation, san francisco, staircases, street gardens, trees, urban, urban hike, vertical gardens. Bookmark the permalink.